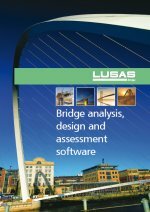 See the adjacent Software Information links for general details regarding LUSAS Bridge software products and options. Prestress / Post-tensioning in LUSAS is suitable for beams, slabs and volumes, and incorporates time-stage with creep and shrinkage. 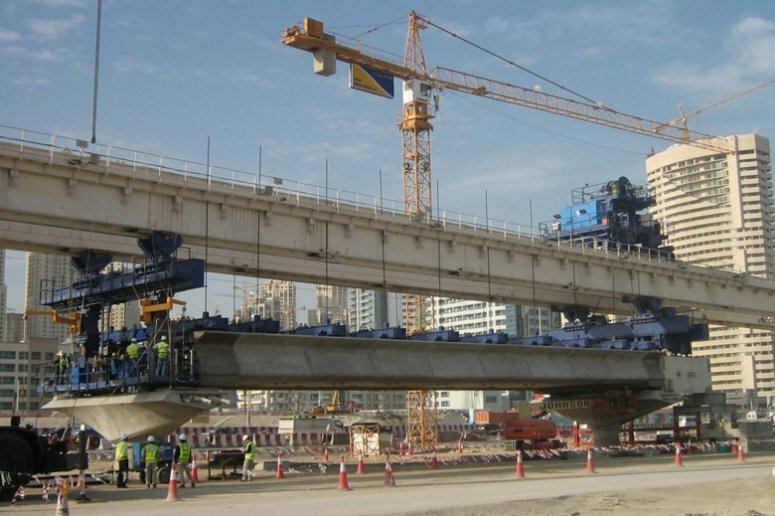 Span-by-span, progressive placement (segmental), balanced cantilever and incremental launching time staged construction methods are supported. LUSAS calculates equivalent nodal loading due to any tendon prestressing or post-tensioning and assigns these forces automatically to beam, shell, or solid elements of a model for a chosen loadcase or set of loadcases. Beam (line), shell (surface) and solid (volume) modelling of concrete is supported. Define tendon profiles and view the developing tendon shape in real-time as it is being defined, or copy and paste data from a spreadsheet. Tendons can also be generated by selecting lines, arcs or splines that are defined or imported into LUSAS Modeller. Manual definition by coordinates in 3D space or by defining coordinates in two 2D planes is supported. Locally defined tendon profiles can be used anywhere in the model and any number of times. Define tendon properties and values/settings relating to instantaneous and time-dependent losses. All other values required in order to carry out calculations of prestress losses in accordance with the design code are obtained directly from the model. Elastic shortening due to stressing of other tendons according to the selected design code or user-defined percentage losses is taken into effect. Time dependent effects can also be considered. Based on time inputs and calculated stresses, which allow for producing details and results of losses at any time and for any stage of construction. Approximate, requiring input of estimated stresses, which allow for producing details and results of short term and long term losses only. For design codes that support time-dependent loss calculations, adjustment of losses to account for prior losses are also calculated. Simply assign the tendon loading (which associates a tendon profile and a tendon property with a specified prestress force and associated jacking and loss details) by dragging and dropping it onto selected line, surface or volume features in a model for a single or a range of loadcases. When solving a model, LUSAS calculates equivalent nodal loading from the assigned prestress tendon loads and assigns these forces automatically to those features (and hence nodes and elements) of the model for a specified loadcase. Discrete loads and the applied forces / moments calculated can be viewed for checking purposes. Produce graphs of tendon prestress force after time-dependent losses. Add tendon properties, profile, loading, losses and setting-out data for all tendons assigned to a model to a model report. Produce reports of tendon properties, profile, loading, losses and setting-out data for all or selected tendons. For modelling external tendons as, for example, where external tendons are included between deflector plates in a structure, the tendons can be incorporated into the model as bar/ beam elements with applied forces, and typically requires shell or solid elements to be used to model the structure. Modelled in this way, the true behaviour of tendons due to the compression of the concrete is obtained. Alternatively, equivalent load methods could also be used. All types of time staged construction methods can be used in conjunction with the post-tensioning facility. See the staged construction analysis information page for more details. Any modelling and analysis capabilities described on this page are dependent upon the LUSAS software product and version in use. Last modified: October 31, 2018.